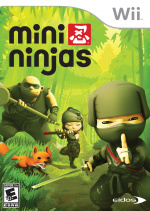 Eidos and IO Interactive's Wii and DS game Mini Ninjas, a cartoony take on the tiniest of warriors, has a few very important dates. Release dates, that is! North Americans, you get your tiny turn on September 8. PALs, you're up on Sept 11. Unless you're in Germany or France, then you have to wait until October 9. Mini Ninjas is an adventure game that takes place in feudal Japan where you team up with tiny ninjas Hiro, Futo and their clan as they try to restore harmony to a world falling apart. Enjoy this new vignette to get yourself in the mood! I've kept my eyse on this, might pick it up depending on reviews. I've been curious about this game. Maybe I'll watch the video tomorrow when I can get on a computer. Hmm...I haven't seen any gameplay yet, but the animated advertisements sell the game well. It's hard to say if this is a future purchase for me, or not. If the reviews are positive then yes I'll for sure rent this. Duuuuuuude, Wolverine ninja? Hell yes. FIRST.....looks around....IS THERE ANY POINT IN LIVING ANYMORE? Futo had to be the funniest one. But tora is the ninja i want to play with. Wow, liking the art style. But we all know ninjas never sleep. Why do we, and France, have to wait till 9. October??? From the makers of Hitman, should be pretty high quality. I've had this game radared for a long time. I will be interested to see how it turns out. Unless they make all 4 versions IDENTICAL except for controls. I hate how multiplatform games are always like completely different games. I have my minds eye trained upon this. Looks great! I always try buy Nintendo on games whenever I can, but I might have to go with the 360 in this one. 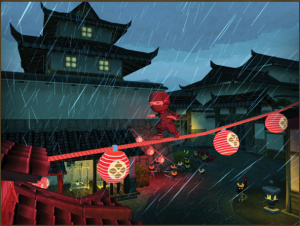 Hmm...this looks really good, but Muramasa is coming shortly after this game. Both look extremely good, so hopefully both deliver.